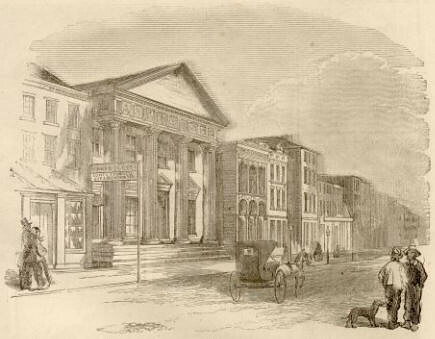 Charleston's Financial District before the Civil War. This is a newspaper illustration of a row of banking houses and commodity brokerages on the west side of East Bay Street, just north of Broad Street. c. 1860. These buildings survived the Civil War, though the businesses most often did not. All but two of the smaller buildings shown here were eventually pulled down and cleared to make way for parking lots in the 1950's.